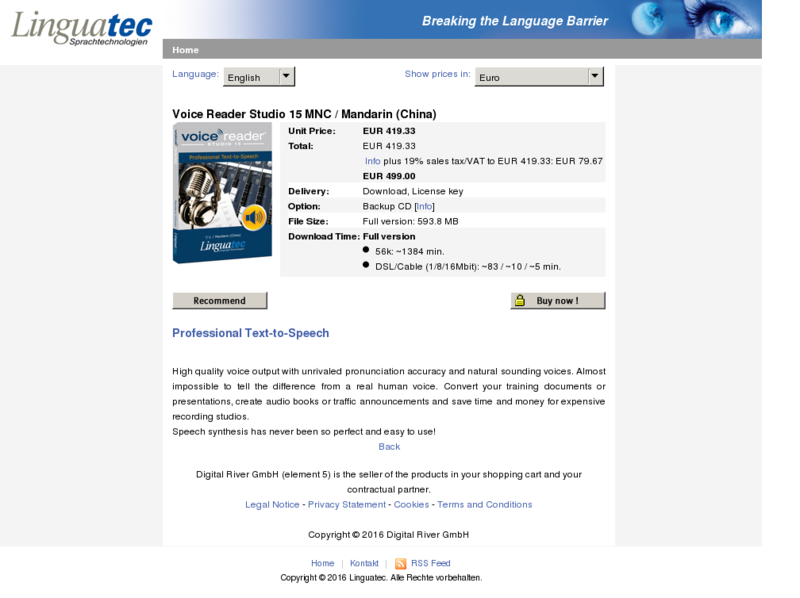 High quality voice output with unrivaled pronunciation accuracy and natural sounding voices. Almost impossible to tell the difference from a real human voice. Convert your training documents or presentations, create audio books or traffic announcements and save time and money for expensive recording studios. Speech synthesis has never been so perfect and easy to use! DSL/Cable (1/8/16Mbit): ~44 / ~5 / ~3 min. DSL/Cable (1/8/16Mbit): ~94 / ~12 / ~6 min. DSL/Cable (1/8/16Mbit): ~52 / ~7 / ~3 min. DSL/Cable (1/8/16Mbit): ~150 / ~19 / ~9 min. DSL/Cable (1/8/16Mbit): ~112 / ~14 / ~7 min. DSL/Cable (1/8/16Mbit): ~54 / ~7 / ~3 min. DSL/Cable (1/8/16Mbit): ~38 / ~5 / ~2 min. DSL/Cable (1/8/16Mbit): ~66 / ~8 / ~4 min. DSL/Cable (1/8/16Mbit): ~121 / ~15 / ~8 min. DSL/Cable (1/8/16Mbit): ~43 / ~5 / ~3 min. DSL/Cable (1/8/16Mbit): ~103 / ~13 / ~6 min. DSL/Cable (1/8/16Mbit): ~60 / ~7 / ~4 min. DSL/Cable (1/8/16Mbit): ~60 / ~8 / ~4 min. DSL/Cable (1/8/16Mbit): ~105 / ~13 / ~7 min. DSL/Cable (1/8/16Mbit): ~42 / ~5 / ~3 min. DSL/Cable (1/8/16Mbit): ~115 / ~14 / ~7 min.